21 May 2009. Road rules controlling bikes in South Australia appear to ban cargo bikes and any other bike wider than 700 millimetres. This means that many styles of bicycle of increasing popularity such as cargo bikes and cruisers with wide handlebars could be seen as illegal for use on South Australian roads. I wondered how these rules compare with the Danish traffic regulation concerning bicycles. Perhaps Bicycle Victoria can use them in their work. It's good to have Best Practice to refer to. - A cycle can have a maximum of four wheels. Trailers can have a maximum of two wheels. - Bicycles must not be wider than 1 metre. - The handlebars must not exceed 70 cm in width. 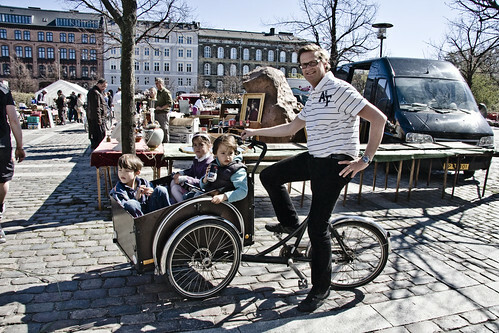 - Cycles with more than two wheels [cargo bikes], however, are allowed a maximum width of 1.25 metres. - Bicycles, including a trailer, must not exceed 3.5 metres in length. - It is permitted to attach a trailer or a sidecar on bicycles. 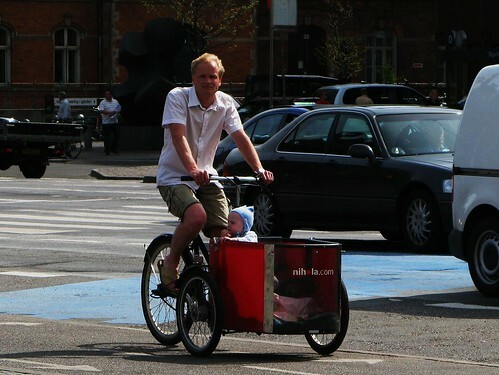 So, the Bicycle Victoria article is right about how the South Australian laws restrict cargo bikes, but the handlebar width is the same in Denmark. I just took a measuring tape and measured out 70 cm. It's massive wide. I've never ridden a bike with handlebars THAT wide. The funny thing is that there are no rules about the HEIGHT of a bicycle so the Tall Bikes Gang are as safe as a safe thing. While we're at it, here are some other Danish traffic regulations regarding the bicycle, all of them virtually completely and utterly unenforced because the police have better things to do with their time. - There can be a maximum of two children in a trailer. - If there are passengers on the bicycle, the driver must be over 15 years old. - A bicycle must have two independent brakes, one on the front wheel and one on the back. Cargo bikes must also have a parking brake. - A bicycle must have, between sunset and sunrise, front and back lights that can be seen from a distance of at least 300 metres. The lights must also be visible from the sides. Blinking lights are allowed. Here's more about the bike light regulations. - A bicycle must be equipped with a bell. Horns, etc, may not be used. - A bicycle must be equipped with a white reflector on the front and a red reflector on the back, two yellow reflectors on the pedals which are visible from behind and at least one reflector visible from the side. Alternatively it is permitted to have wheels with built-in reflectors. It is allowed to mount more than one reflector.